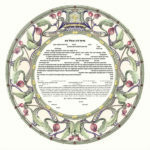 Through the delightful use of color and the simplicity of its design, the Pomegranate ketubah conveys the joy we feel in the celebration of marriage . The overall circular composition of pomegranates and leaves playfully intertwined is a visual metaphor for the weaving together of the lives of the bride and groom. 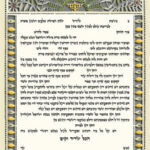 The pomegranate attributed to have 613 seeds (equal to the number of mitzvot in the Torah) is a symbol in Judaism for righteousness, wisdom and fruitfulness; combine this with love and laughter and you have the main ingredients for a flourishing life together. 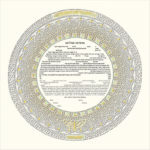 This giclee print ketubah is a paper cut with hand applied 24 karat embellishment. 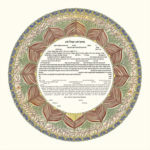 A limited edition, numbered and signed by the artist. 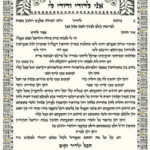 “Siman Tov. 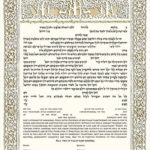 May this be an auspicious time.” is the fervent cry that follows the breaking of the glass at the marriage ceremony. 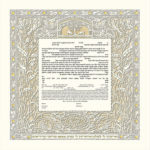 It is an expression of the shared joy of the celebrants and their heartfelt wishes for the bride and groom's future. 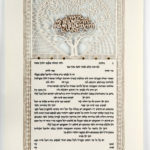 The Siman Tov ketubah is a delicate paper cut reminiscent of fine Belgian lace. 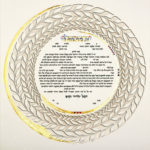 There is exquisite detail in the weave of the motifs and in the application of the 24- karat gold leaf. This symphony of decorative elements creates a harmonious composition, as are our wishes for the new couple's shared life. 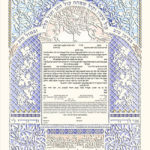 All ketubot by Daniel Azoulay are printed in Israel. 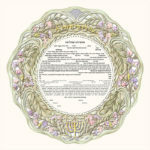 The visual metaphor of the coming together of the bride and groom and the fusion of their separate lives becoming one is particularly poignant in the Greenwood ketubah. 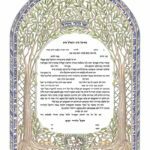 The two trees flanking the ketubah's text are separate entities, and yet, their roots grow towards each other, meet and begin to intertwine. Above, their branches and leaves spread out and unite to create a canopy; a bridge in the sky with the words from Song of Songs: I am my beloved's and my beloved is mine. Below, a shelter is formed by the foliage above, providing a place where two deer may find refuge and seek repose This simple image encapsulates the hopes and aspirations of the new couple, who come to each other as individuals, making a bond that strengthens one another, as they grow while sharing their life together.